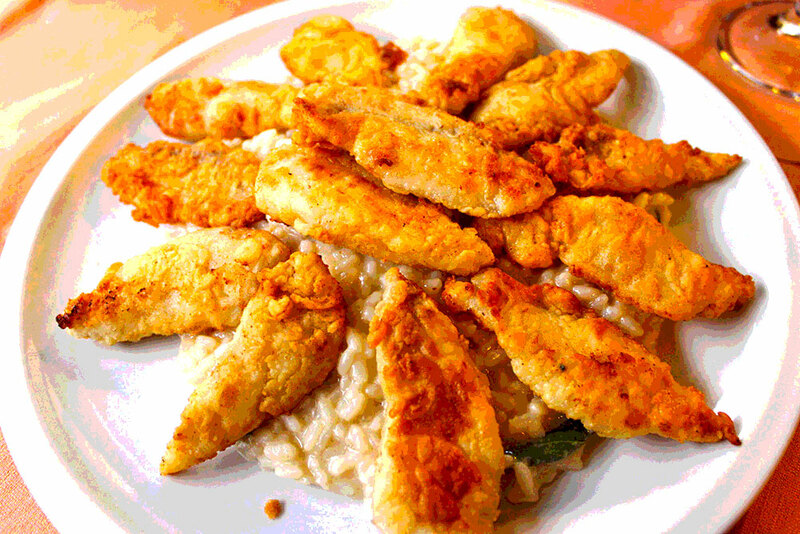 Rice with perch is one of the most loved on the shores of Lake Como, so here is the typical recipe for 4 people. First, beat the eggs in a bowl deep enough to dip the perch fillets. Then bread them with breadcrumbs. Meanwhile, in a non-stick pan, melt the aromatised butter with some fresh sage leaves and cook the fillets on both sides for about 5 minutes. To keep the fillets warm, you can place them in the oven at about 50°. At the end of the frying, filter the butter, which will be mixed with the rice when it is cooked. In a saucepan, pour a knob of butter and brown rice for a few minutes, then add at least 800 ml of water. Boil for about 15 minutes, then drain and add the butter that you had put aside. Stir for a few minutes and place 3-4 fillets of perch on each plate.